The 7.5 magnitude earthquake, that rattled the Indonesian island of Sulawesi Friday September 28, triggered a tsunami by Palu claiming the lives of over 380 people. Witnesses reported waves up to 10 feet high crashing down on this port city creating mass panic and claiming hundreds of lives. Several aftershocks of the earthquake continue to be felt today as rescue workers aid the victims. HHRD’s partner organization PKPU is in Palu sharing information about the situation on the ground as they conduct needs assessment. 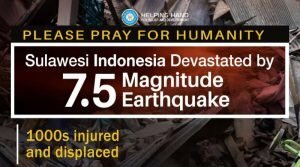 Donate to our Indonesia Relief Fund to help provide food, water, shelter and medicine to the victims of this horrific disaster.